This is the 100th blog post on Vitamin Valentine! I’ve been wanting to post a recipe recently but October and November were super busy due to school and work so for my 100th post I’ll be sharing some personal updates. These past few months have been busy because I’m taking a pretty intense research class which is preparing me for writing my master’s thesis next semester. I’m also planning something that could lead to career advancement (but I’m keeping the details of that a secret, for now). If you haven’t been reading my blog for long, I’m currently completing my master’s in nutrition and I work full-time as a community nutritionist working with women, infants, and children (WIC). Hopefully I’ll have some more time in mid-december and january to post some delicious, vegan recipes in blog post #101! If you’re like me, you rarely have time to eat a complete meal in the morning, or if you do, it feels rushed. 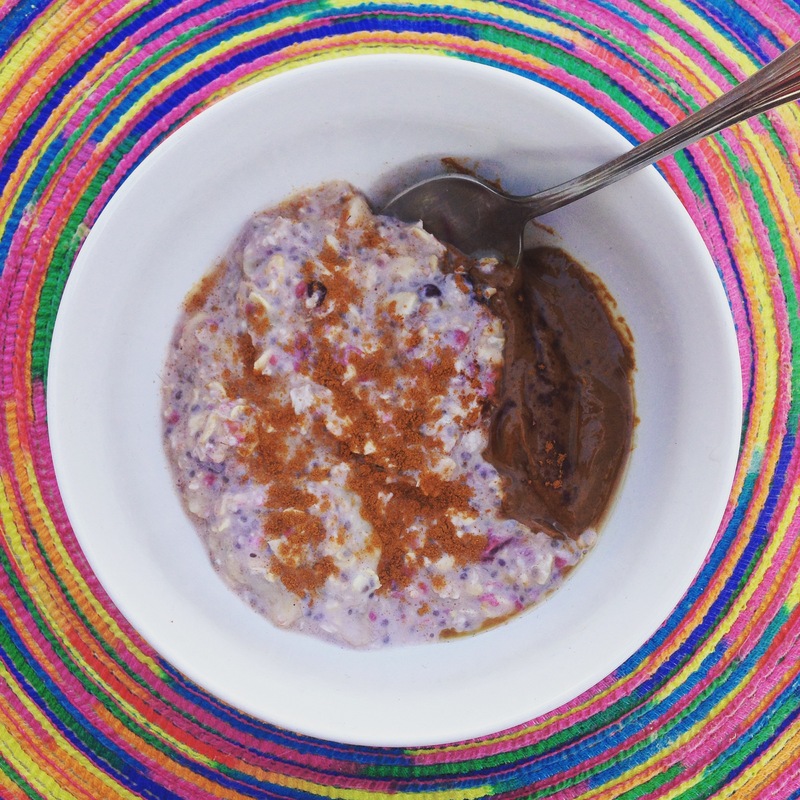 Enter the genius concept of overnight oats. No longer will you feel frazzled as you try to prepare something healthy in the early hours of the AM, because you’re going to do it the night before (muah-ha-ha…that’s my attempt at evil laughing). These oats are packed with fiber from the oats, fruit, and chia seeds, along with some plant-based protein, and healthy fats. This is a breakfast I’ve been eating lately and it makes my morning meal prep super easy because all I have to do is remove from the fridge and add a little AB (almond butter). The oats will be fluffy and ready to eat without microwaving, which makes this a great morning meal for the summer months (because who wants to eat a hot meal when its 90 degrees out. Not this girl!). 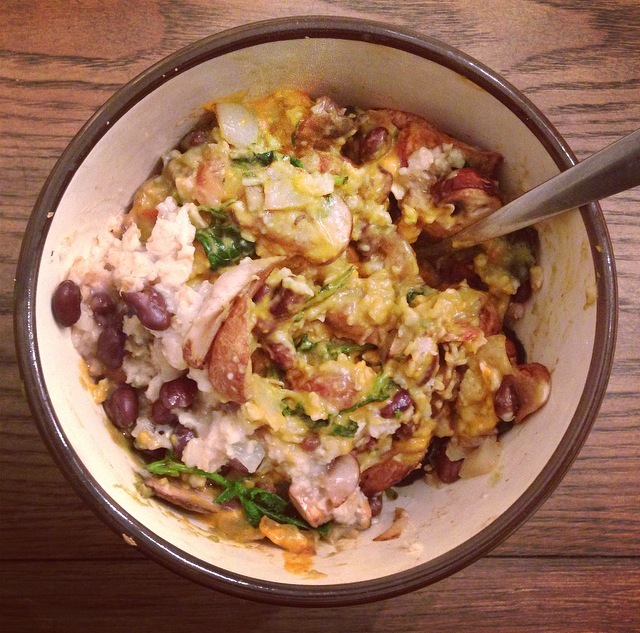 I look forward to sharing more of my healthy meal ideas as soon as my spring semester winds down! I’m finally done with another semester of being a nutrition student, yay! This semester was probably my toughest one yet because of the amount of courses I decided to take, along with yoga teacher training, balancing a job, and trying to fit in time for my own yoga practice. One thing that definitely helped me this semester was fitting in time to de-stress. Yoga helped, as did some other activities, such as baking, spending time outdoors, and curling up with a good book. If you find yourself overwhelmed, I recommend doing some activities that take your mind off whatever is stressing you out. During my finals week, I realized how important it is to do things that feed your soul instead of focusing either exclusively on work/obligations or doing things that provide a sense of fleeting fun. Although technically the following recipe isn’t a “baked good”, it still kept me occupied in the kitchen and turned out to be a really healthy, filling little treat. Coming up with cheaper alternatives to my favorite packaged snack foods is now an official hobby, so I present to you, my raw balls. Okay, get your mind out of the gutter. 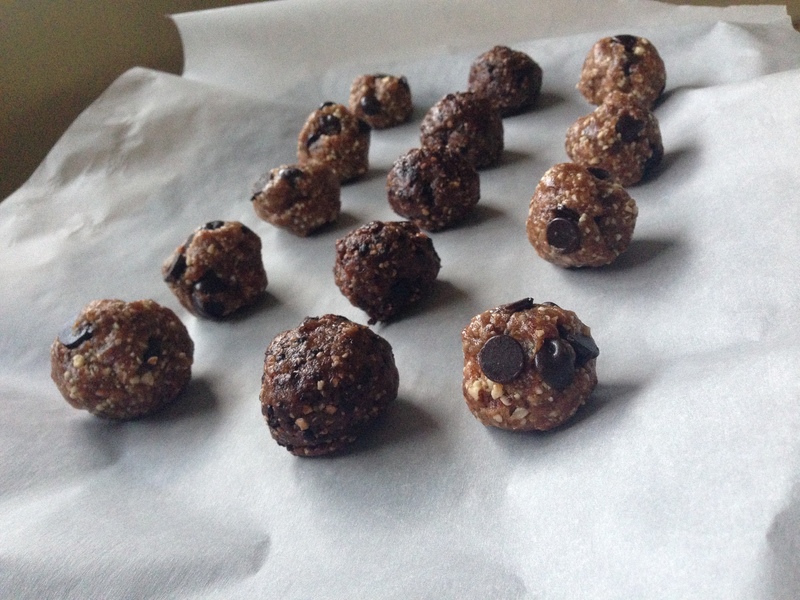 These delicious balls are made of (mostly) all raw ingredients and are chock full of healthy, plant-based fats and fiber. They also make a great present if you haven’t bought your holiday gifts yet. In a large bowl, combine pitted dates, nuts, and vanilla extract. Transfer to a food processor and process/pulse for a minute or two. The mixture should be easily moldable with your hands. If the mixture is too sticky, add a few more nuts by the tablespoon, and continue to use the food processor. If the mixture has too many nuts and won’t mold together with your hands, try adding a few more pitted dates. Transfer back into the large bowl and add chocolate chips. Mold into ball shapes with your hands and refrigerate. Enjoy! Combine pitted dates, nuts, dried cherries, and cocoa powder together and transfer to a food processor. Process until blended for about a minute of two. If the consistency is too dry and the mixture won’t mold with your hands, try adding a few more dates. If it’s too sticky, add a few more nuts by the tablespoon. Transfer to a bowl and then using your hands, mold the mixture into ball shapes and refrigerate. Enjoy!